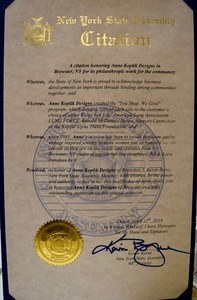 Anne Koplik Designs, a jewelry designer and manufacterer located on Main Street in Brewster, has received a NY State Assembly Citation for their Philanthropic endeavors in the community. 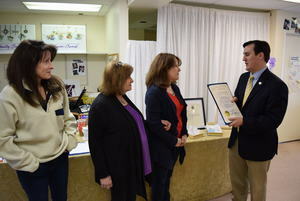 Assemblyman Kevin Byrne, (R,C,Ref-Mahopac) stopped by the showroom today to bestow the Citation upon company owners, Anne DiFranco, Jill Yee & Kara Garecht. The company has been donating a portion of their sales to several national and local charities for years including the American Cancer Society, The American Lung Association, Ronald McDonald House and Support Connection along with the Kappa Alpha Theta Foundation. Doing business since 1981, Anne Koplik jewelry collections are proudly designed and handcrafted in their Brewster, NY studio. Anne and her team of skilled American artisans handcraft vintage inspired jewelry with crystals from Swarovski®. Each piece of jewelry is created for women who want to experience beautiful antique-inspired designs and have them for their own, at an attainable price. Her Jewelry has been featured on ABC Tv's "Dancing With The Stars" for several years. 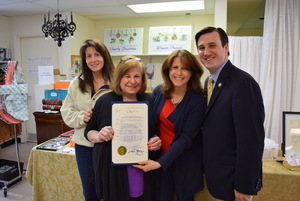 Anne Koplik Designs created the "You Shop, We Give" program, which donates 20% of each sale to the customer's choice of either Relay For Life, American Lung Association LUNG FORCE, Ronald McDonald House, Support Connection or the Kappa Alpha Theta Foundation. Co-Owner Kara Garecht proudly accepted the Citation saying "We are proud to be able to give back to the community in which we live and work". The company this week introduced two new bracelets, The "Relay For Life" Bangle bracelet and the Ronald McDonald House of Greater Hudson Valley. A portion of the sale from those bracelets will be donated to the respective charities for which they are named. They are holding a showroom sale this weekend to celebrate the launch of the new products. To learn more about Anne Kolpik designs, visit their website by clicking on the link. annekoplik.com or by calling 1-800-542-3134.